When I happened to check my work email on Friday night, I was pleasantly surprised to find an invite to the press weekend beta of upcoming superhero MMORPG, Champions Online. After a (surprisingly quick) download and install, I was online and getting started. Boy, was I ever just getting started. 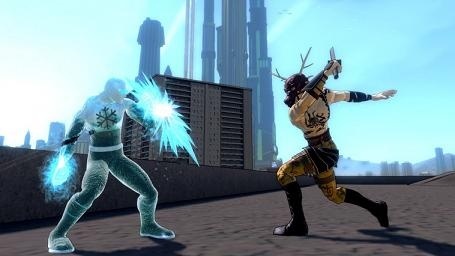 If you're familiar with Cryptic's first two superhero MMOs, City of Villains and City of Heroes - now in custody of NCSoft - you'll probably have an idea of how complex the character creation process can be. First, you need to choose an archetype - do you want to be a tank? Do you want to be nimbile and agile and avoid hits? Do you want to do higher consistent damage, or have more spike damage with powerful critical hits, etc. Once you've done that, you get to pick what sort of powers your hero has, and you've got the standard gamut of superhero abilities. Is your hero a telepath like Professor X, or do you want to be like the Human Torch and burn things instead? Maybe you want to be a normal guy with a gadgets or a suit of power armor (hey there, Iron Man), maybe you want to be a super martial artist, or maybe you just want to have guns - lots of guns. I was actually really pleased with the variety of choices here, and Cryptic has done a good job at getting away from a more restrictive class-based system. There are a lot of options to be had. As with City of X, there are even more options when it comes to creating how your character looks. There are almost too many options, honestly - there are so many different sliders and costume choices for every little part of your superhero's outfit that it's easy to get overwhelmed. The people who want to spend hours designing their appearance will undoubtedly be able to pull something great out of it. For someone who wants to just get started right away, it might be a bit more of a hassle (that said, the Randomizer can certainly come up with some nifty-looking superheroes if you give it a few clicks). I ended up going with a female telekinetic, who I named Psiona and dressed in a skimpy miniskirt. What, like you wouldn't do the same? Yeah, that's what I thought. The tutorial starts you off in the midst of an alien invasion of Millennium City, with the public needing a new super-powered hero to step up and help save the day! (That's you, by the way) Combat in Champions Online is actually pretty fun, and very mobile - it's quite entertaining to be circling around an alien and peppering him with a barrage of psychic blasts before running in and busting out a kinetic sword. It also does some other cool things: You'll be able to see the general area where you can complete a quest on the map, for one. I was also able to pick up some objects and use them as weapons - bashing aliens with a postal box is surprisingly entertaining (alas, characters will need super strength to pick up larger objects like cars). Once I was able to choose my super-method of travel, I opted to go with Spiderman-style swinging, and it's terrific fun to be swooping about the city.